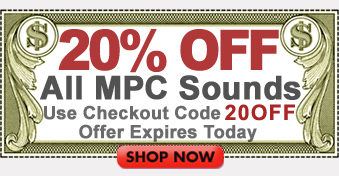 MPCsounds.com - The #1 Sound Developer for Akai MPC Drum Machines! Hip Hop Production is what we are all about and we have got the Billboard credits to prove it. All MPCsounds.com drum kits include every MPC-format within a single download (PGM/SND/WAV) and auto-load into any MPC drum model of your choice. All samples & loops are available for instant download. Each order comes bundled with free Song Submit uploads where you can submit your music to record labels looking for artists, a&r, and radio free who are searching for quality hip-hop, pop, & R&B music. Free MPC sample kits are available upon email sign-up, plus we also offer music contracts that were designed specifically for today's hip hop producer! Need samples & loops for music software? Visit ModernBeats.com for Hip-Hop Samples & Loops in software formats.